Ten years later, look what’s changed! Microsoft screwed up, and they know it. The last version of Windows was a turkey stuffed with some pretty dumb features. I’ve spent some time with the latest version of Windows, though, and it looks like it could be a winner. You thought I was talking about Vista and Windows 7? 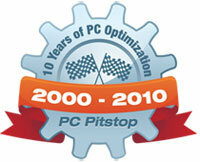 Nope, this is a look at ten years of system optimization at PC Pitstop, and I started at the beginning. The decade opened with a Microsoft disaster called Windows Me, followed by a decade-long success called Windows XP that still rules today. But it just goes to show a big company like Microsoft doesn’t always learn from its mistakes.